This week, we were seafood junkies. Not just because we love all things seafood, but because of a specific inspiration. In our recent travels to Iceland, we had the most amazing dining experiences every night. It wasn’t just for the exceptional chefs and unique presentations, it had very much to do with the fact that the main ingredient of every dish was plucked from the sea that very day, and masterfully prepared that same evening. The freshest ingredients are always the secret ingredient and can edify the simplest of recipes. While on the way to Reykjavik, we had the opportunity to see Chef Volundur Volundarsons prepare a compelling stuffed langoustine cake, which was the inspiration for this recipe. Although we wanted to get our hands on fresh langoustines, it’s a difficult challenge here in the States. This is a simple recipe with an elegant finish. 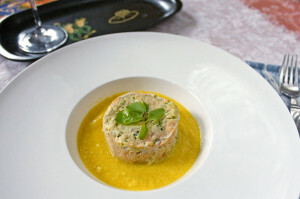 The stuffed seafood roulade was delicate with hints of lemon and coriander. The savory sabayon offered a velvety base that complimented the roulade, and which included fresh shrimp stock made from the shells of the very shrimp used in this recipe. Having learned long ago to always make extra, we had the opportunity to enjoy this one a few times and satisfied our addiction to fresh seafood. In a food processor, pulse shrimp and scallops until just fine, then transfer to a mixing bowl. Add the egg whites to the mixture along with coriander, cayenne, panko, and season with salt and fresh ground pepper. Then mix thoroughly. On a clean flat surface, lay out a large sheet of plastic wrap (about two to three feet). Lightly oil the top of the plastic wrap. Spread the seafood mixture evenly in a long rectangular shape (about four inches wide) on top of the plastic wrap, leaving several inches on all sides. Cut off the corner of the Ziploc bag next to the cream-cheese mixture and squeeze it out in an even thick ribbon across the middle of the mixture rectangle. Lift the protruding plastic wrap parallel to the strip of cream cheese, and gently roll moving across the rectangle enclosing cream cheese. Twist the ends of the plastic wrap to close the roll thoroughly, and put it in the refrigerator to chill for 30 minutes. Place seafood roll on surface, and cut the roll while it is still in the plastic wrap about three inches in length. Place cakes on baking sheet lined with parchment paper, remove the plastic wrap. Bake 10 minutes, remove from oven and let rest. Plate with a serving of sabayon sauce and place seafood roulade gently on top of sauce. Garnish with fresh herbs or micro greens. In a food processor, add all ingredients and pulse several times to combine. Transfer the mixture into a Ziploc bag, squeezing it towards one of the closed corners. In a small saucepan, add peppers with stock and thyme sprig and simmer for 15 minutes. Pour mixture into a blender and process for 1 minute. Pass purée through a wire-mesh conical sieve into the top pan of a bain marie and let cool. In a bain marie or bowl over simmering water, add egg yolks to liquid and whisk to a ribbon consistency. Whisk in butter, a little at a time, season to taste with salt and pepper and serve. In a saucepan, add ingredients and bring to a boil. Reduce heat to low, and simmer for 20 minutes. Remove from heat and let cool. Strain stock through a fine mesh sieve into separate sauce pan, and discard solids. This entry was posted in Cooking, Fall, Main Dishes, Summer and tagged Sauces, Seafood by cfaust. Bookmark the permalink.